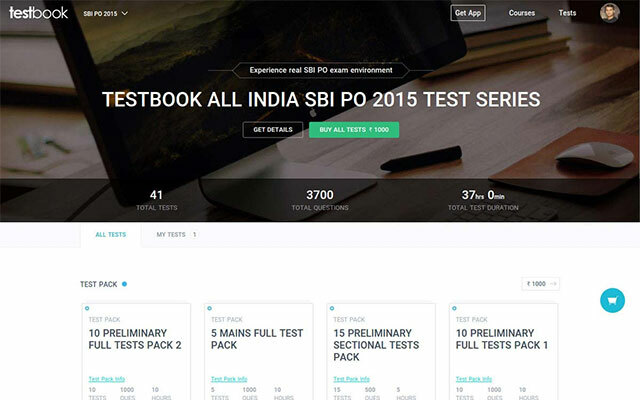 Testbook.com, an online test preparation platform for competitive exams, has raised an undisclosed amount in funding from education content provider S Chand & Co Pvt Ltd.
Mumbai-based Share Infotech Pvt Ltd, which runs Testbook, will use the money raised to expand into new markets, it said in a statement. Testbook is an online test preparation platform for competitive exams such as GATE, CAT, SBI PO and IBPS PO, besides others. The platform allows students to give live tests and is designed to simulate an environment similar to the actual examination, the company claims. Testbook has conducted about 750,000 tests for its 400,000 users, said Ashutosh Kumar, the company's co-founder and CEO. Its mobile app has clocked about 100,000 downloads so far. The startup was founded in early 2014 by a group of IIT Bombay and IIT Delhi alumni - Kumar, Narendra Agrawal, Yadvendar Champawat, Abhishek Sagar, Manoj Munna and Praveen Agrawal. Education-focused publishing house S Chand & Company Pvt Ltd publishes a variety of books catering to up to 12th standard (or K-12), higher education, competitive exams and children’s books. Besides, it offers digital learning solutions for government and private schools and engineering colleges through joint ventures. S Chand had raised nearly Rs 179 crore ($27 million) from International Finance Corporation (IFC), the private sector investment arm of the World Bank, and its existing investor Everstone Capital in November 2015. Founded in 1939 by Shyam Lal Gupta, the S Chand group is now owned and managed by Himanshu Gupta and Dinesh Kumar Jhunjhnuwala and their families. With an increasing number of online learning startups, the online test preparation market has started to see early signs of consolidation. Several M&As have happened in the space over the last few months. Mumbai-based online test preparation portal Toppr had acquired edu-tech startup Manch last month. In April last year, it had acquired EasyPrep, an online entrance exam preparation platform, for an undisclosed amount. Singapore-based XSEED Education Pte acquired online learning management business of Pleolabs in the same month. In December 2015, Bangalore-based MockBank.com, which provides online mock tests for government job aspirants, acquired Litoro, a Vijayawada-based web and mobile services company. In March 2015, Mumbai based ed-tech startup for competitive entrance test preparation, Embibe.com, had acquired 100Marks, a student guidance platform for JEE main and advanced.